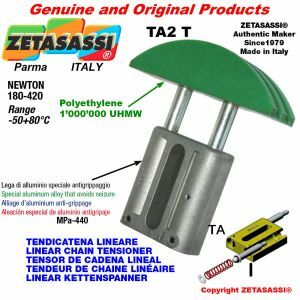 Automatic chain linear tensioners type TA are automatic devices which allow to keep the right tension of the transmission chain so it lasts longer. These automatic chain tensioners do not need the intervention of any workers so you can save time for the maintenance and for the control of the machineries on which they are set up. 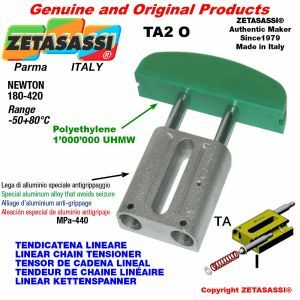 Automatic linear chain tensioners type TO – ET – TA are made of a body in a special aluminium alloy that avoids seizure so the zinc-plated stud bolts can perfectly slide in a high strength steel in the point where the head is set up. 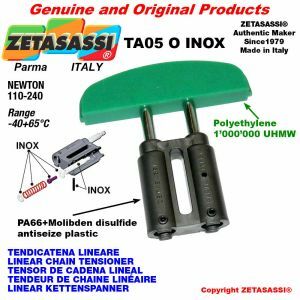 The linear chain tensioners type NT has an aluminium body that is closed in the lower part to avoid the seepage of external agents . 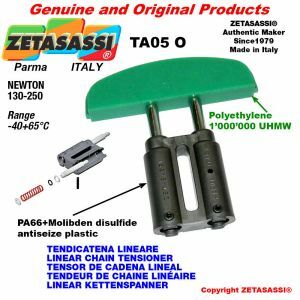 Automatic tensioners type NT has sliding bush used for the stud bolts and it is made of a plastic material. 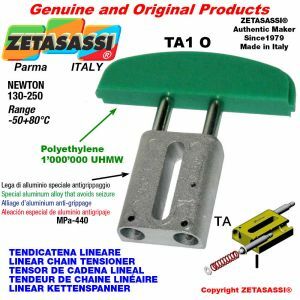 Linear chain tensioners type TO – TA – NT have a tension head made of a plastic material that avoids wear and tear and has a very low friction coefficient ( polyethylene 1'000'000 UHMW dynamic friction coefficient 0.06 dry steel) they can resist to a temperature of 80°C. The polyethylene heads, that can be in 3 different profiles, have a wear and tear reduced to nothing ( at the above temperature) and they can be used according to the ISO and ASA proceedings on simple, double or triple chain drive. That can cause wear and tear to gum or plastic. You can reach a temperature of 130°. On the stud bolts they have head made of a light die cast alloy where it is possible to set up pulleys, sprockets, pinions, etc. 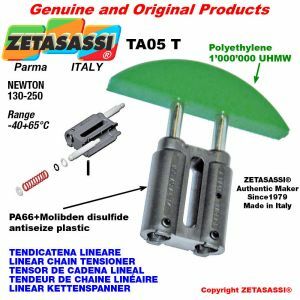 Type TA 05 are a plastic version with body made of PA66+Molybdenum Disulfide and the head made of polyethylene 1000. For all the types above you can have a version with stud bolts, spring and all the setting up devices made of steel AISI 304.